One of the things that I decided to do this year was play fully painted as often as possible. 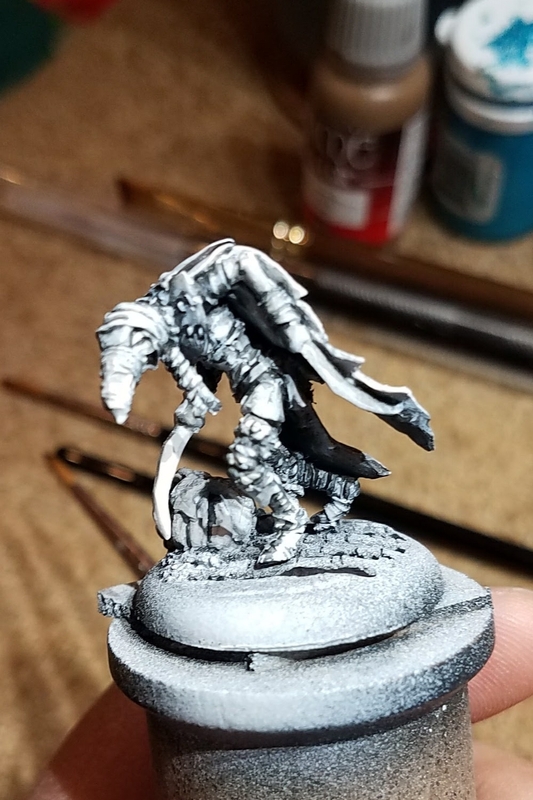 Earlier this year, I got Circle lists fully painted for ATC, Seattle Open, and several other events, and when I picked up Grymkin I decided that I needed to continue this pattern since 1) it feels awesome to play fully painted and 2) painted armies look much nicer for you guys when I write battle reports. This proved to be a bit of a challenge, since work, school, and parenthood all take their time, and although there are not a ton of different units and models in the Grymkin line, they're all playable and excellent in the right situations. Furthermore, when I painted those two Skin and Moans, I felt like I was on a bit of a plateau skill-wise. I was getting pretty good at blending, but I couldn't make things like as distinct and finished as I wanted to. Naturally, I sought out a teacher - in this case it was Matt DiPietro of Contrast Miniatures. Matt is a former Studio Painter for Privateer Press and lives a convenient few hour drive away from me. After a series of conversations with him, we decided that what I could work on the most and see the best improvement on was contrast, that is the difference in tone (color) or value (light and dark) between two pieces. After a lesson and some encouragement, I was able to start doing his signature Sketch Style painting on my own. And a comparison between him and one of my original ones. Some pretty obvious differences here. First, I wasn't very confidant with glazes yet, so my Sketch Style Skin and Moans is less pink. Secondly, the contrast is far more intense, and the lighting appears to come from a single direction rather than all over. You can especially see this on the back, as it looks like the left side is strongly illuminated and the right side is not. Regardless of which you prefer, the Sketch Style version took a third of the time and still produces a very nice, high-ish tabletop standard of paint job. So what is Sketch Style? Good question, let's talk about it. Sketch style is a method of painting where you spend the majority of your painting time on a very comprehensive "underpainting" composed of entirely black, white, and grey tones. It is accomplished by a combination of Zenithal priming (more on that in a second) and careful application of light and dark paint. You end up with a very, very high contrast black and white model which you can then layer thin glazes and inks over. Matt Recommends p3 Primer for most people, although I've had good success with Krylon Matte White over Rustoleum Black Enamel. Furthermore, for high quality paint jobs, Matt uses an Airbrush to apply the white over the black, as it leads to smoother transitions and doesn't give the speckled look that a rattle-can of primer will give you. 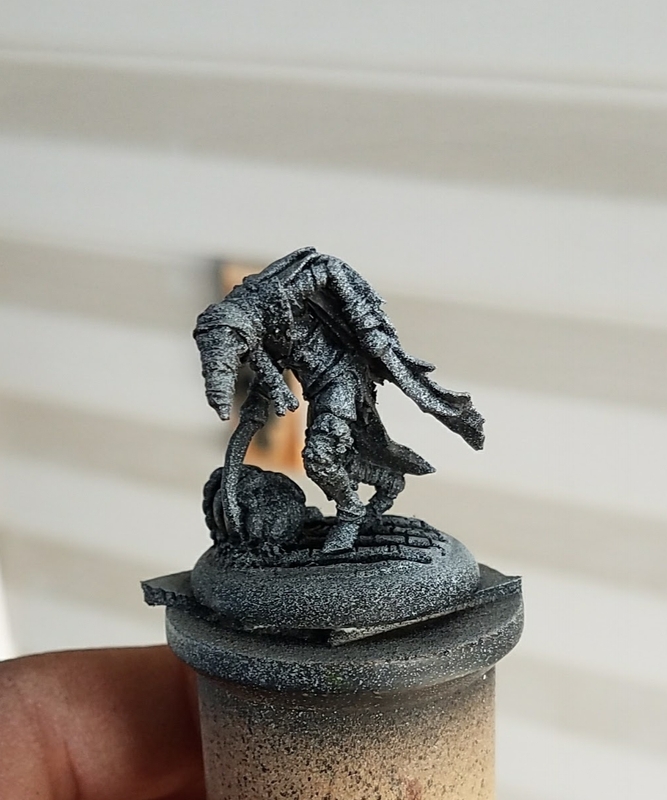 The entire piece starts with Zenithal priming, which is a style of priming where the entire model is primed black and then has a layer of white or grey primer applied over top of it. In Sketch Style, you apply a gentle burst of white over the black at a 45* angle from the top on all sides and also from above. We're going to use a Murder Crow from Grymkin to demonstrate in this article. Total time for painting this model, including pictures, was about an hour from dried primer to finished model. Secondly, we apply a soft burst of white primer at 45 degree angle from above in all directions. You'll notice that the far right picture is less bright than the other two - this was a deliberate choice. Before starting, I had determined that I wanted the strongest light to be on the front of the model (where the face is), and so I didn't put quite as much into the back. This light undercoat is there to simulate diffuse light, or the light that's all around when an object is sitting around with light bouncing back to it from other objects. Wait...light bounces around from other things? When light hits something, some of it is absorbed and some of it is reflected. An object absorbs a variety of colors of light, and then it bounces back the others. A green leaf for example, absorbs all the colors of light except green and then bounces the green light back to your eyes. This only works on things that are rough/textured. On something very smooth, light is perfectly or close to perfectly reflected. This is why metallic things look shiny - they're reflecting lots of light in a concentrated spot. Mirrors are an even more extreme example of this, in that they reflect the light bouncing off the objects almost perfectly so that your eyes can make sense of this. Alright, sorry about that, I'm not sure what came over me. Anyway, the next step is to pick a side of the model that is going to get hit by direct light (sunlight usually) and hit it with a very strong spray of the white primer. For this model, and since the head is usually the focus of the piece, I chose the left/front side of the model (from the model's perspective). Here's the Zenithal priming and the shot after the strong light. This is also a good example of how cheaper primer can be less good - the Krylon stuff I have been using tends to pool in the cracks which can make the next steps a bit harder. Even with that, there's quite a big difference here, and it really sets the stage for the rest of the model. 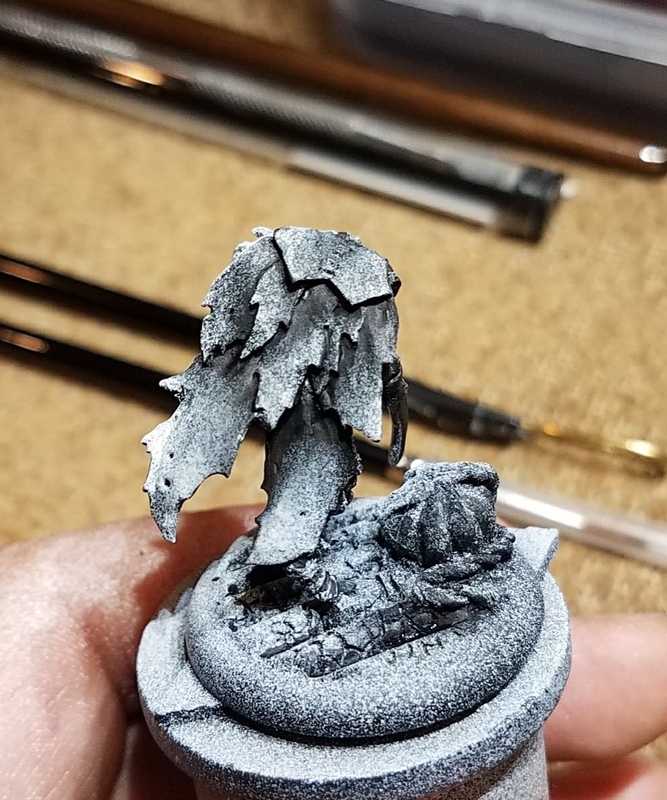 One of the biggest mistakes I hear from people trying to paint like this is missing this step. With one quick blast of spray paint, you can establish the focal point of your model; it's quite invaluable. Be sure to let this dry for a few hours, or alternatively use a blow dryer to make sure everything is completely cured. Uncured primer leads to chipped paint jobs. Mix up your black paint with the Payne's Grey Ink in about a 3:2 ratio. The Grey Ink actually makes the black paint darker, letting you do even more contrast than you could with normal paint. 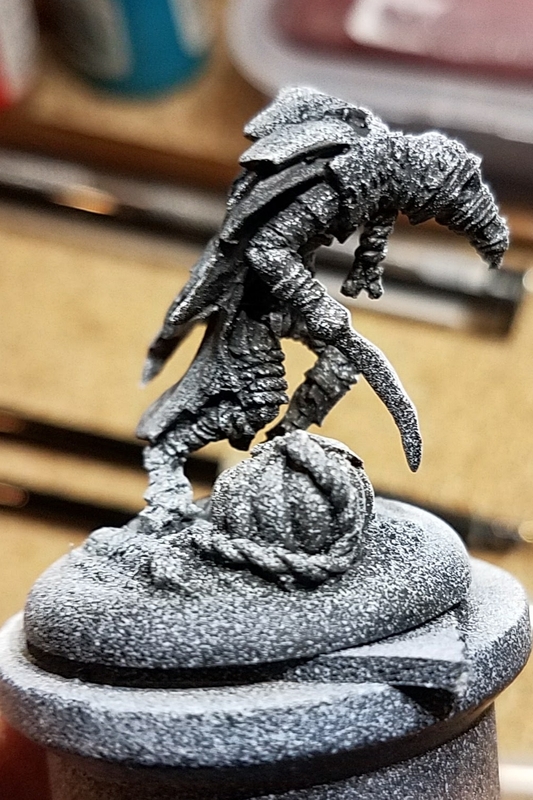 The black color is going to cover approximately 45-50% of your model, with the first layer of whit doing another 25% and the brightest white doing 5%, leaving about 20% of the model with primer exposed. This gives you a nice variety of colors rather than just black, white, and brighter white. Look for the darkest spots on the model and make them darker. You can do this with blending, glazing, or even just chucking paint at the areas in the right shapes. Here are some examples, with the primed model always on the left and the darkened model on the right. As you can see, the black has gone in and done a couple of things. First, it's added some significant shadows to the cloak and back of the pumpkin. I've also gone and and carefully darklined the edges of each piece of cloak. Darklining is a process where you take the dark paint and use it to paint the edges of different surfaces, making them distinct from each other. It takes some practice, and it's the most laborious part of this process, but when I don't do it I regret it later. Here's how the rest of the model looked before and after the black layer. This one here is probably the most subtle, but if you look closely you can see that the side of the blade is darker on the right side picture, and that the edges between the big pieces of cloth are separated by darklining. By contrast, this is the most dramatic difference. I mentioned that the Krylon primer can pool in the cracks, which is the opposite of what we want here, so I've gone in with both blending and also a very thin wash on some of the detail to define it. In the next step, we will come back with white highlights and pick the detail out even more. After getting the Black part of the Sketch done, the rest tends to fly by very quickly, as you're covering far less surface area. With this first layer of white, I like to think of it as my mid-tone and first highlight for when I'm coming in with glazes later. You cover a big surface area with this first one, and you'll come back with the Titanium White later and nest the brighter white inside of this first color. Just like with the black, we're going to use the areas where the primer is white to give us an idea of where the white paint should go. You can blend it in, dry brush it, or glaze it - each has different looks and feels. For this model, I blended. Again, the model with just the black on the left, and then with our first layer of white on the right. Already you can see the crazy contrast that you can get here. Between the black in the darker areas, the darklining, and now the highlights, that cloak pops really well! Here's what the rest of the model looks like now, with, again, the previous step on the left and the new one on the right. What I've mostly done here is edgelighting, and that is more or less the opposite of darklining. Instead of emphasizing the break between two things with a shade, you do it with a highlight instead. In particular, look at the cloth wraps on the beak, the rope on the closes leg, and the folds in the cloth on the sleeve. Here, we've reclaimed our brightest side, while still maintaining the contrast between materials that we got in our shading step. Everything has a dark line between it and its neighbor. Look at the closest arm, the stitching on the cowl, and the rope on the leg for examples of this. What we did with this step is just to touch the raised parts with the white to make them distinct again. This side is clearly the focal point as well, there is a lot more white on this side than there is on any of the others. For the final layer of highlights, we need something even brighter than the white we just used, and that's where Titanium White comes in. This pigment is even brighter than most miniature paint whites, and we can use it to show off extreme highlights or edges of things. Use the white you put down in the previous step as your guide. Make sure the Titanium White doesn't spill out from those spots, and a guideline Matt gave me was not to use Titanium White on the legs or lower. Let's have a look, this one is the most subtle but perhaps most important step. 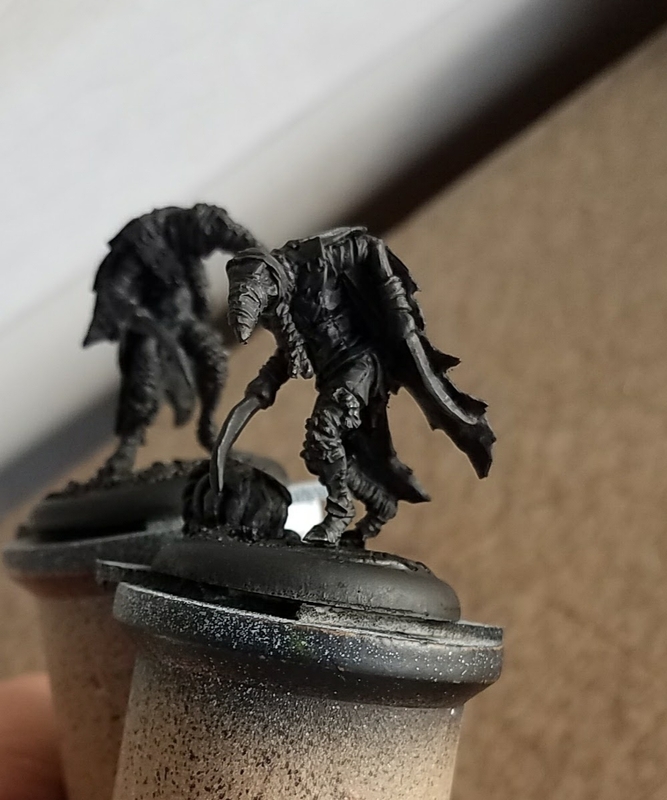 It's an extremely subtle change, and truthfully the camera has a hard time picking it up without a light box, but the one on the right feels like it has more contrast than the one on the left, even if it's just a little bit. Again, very subtle changes, but increases in contrast by little bits here and there add up. Finally, the last thing you do before you move on to glazes is darken in the rim of the base. Matt calls this framing the model, and it's a good way to check and see if you really are done. So like the certified professional I am, I totally spaced and didn't take progress shots for the Murder Crow glaze work. This was partially because I started watching the Punisher after I finished up the Sketch and also partially because I went on to sketch the other five models in the unit and not apply color until the next day. As such, here is the sketch of the model that I will be showing the glaze process on. The first, and most important question is what is a glaze? A glaze is simply a very thinned down paint. It's different than a wash for a number of reasons. First of all, the goal of a glaze is not to seep into cracks like a wash, but rather to sit on the top of the detail like regular paint. As such, it's important to not overload your brush with it when you're going to paint. Secondly, glazes are (virtually) impossible to buy pre-made, and that means you are forced to make your own. On the plus side, once you figure the process out, you can make a glaze in any color you like. How thin should a glaze be? In general, you want it to be very translucent. Here are a couple of examples. The picture on the left is an example of about as thin as you would ever get with a glaze. It's so translucent that it barely tints the white underneath it. On the right, there are two blue glazes. The one on the left of the thumb is an excellent example of a medium glaze, where it tints the white quite strongly but still allows it to shine through. The blue color on the right of the thumb is too thick. Notice how it doesn't let the white show through hardly at all, and the difference between blue over white and blue over fingernail is negligible. For the first layer of glaze on my Piggyback, I started with the brightest color that the skin tone would have - in this case Cygnus Yellow. I thinned it down to a slightly thicker consistency than the example on the left thumbnail above, and I applied it to the entirety of the model's skin. REMEMBER: the goal is for the paint to NOT sink into the crevasses, so don't overload your paintbrush with pigment. You'll notice that the light parts still shine through and the dark parts still look, well, dark. I wasn't happy with how the skin looked (I mean, pigs aren't that yellow usually), and I wanted to put some color into the dark areas. To that end, I took Khardic Flesh and diluted it quite a bit. This time, I layered three glazes into the dark areas, blending it out towards the yellow part. This only took one glaze - blue covers much better than yellow and pink do. Check out the jacket in the picture on the right - one glaze and it looks like it's highlighted and shaded thanks to the sketch underneath it. From there, I picked a dark brown (Vallejo Air Armor Brown) for the wood of the shield and the Imp's legs, again, only one glaze needed (although I did go back and pick out some of the wood grain with a lighter color later). While that was drying, I took a lighter brown (Idrian Flesh) and did a quick glaze on all the leather, followed by a smaller glaze underneath with the Armor Brown. Even though you did an undersketch, sometimes you need to go back in and highlight or shade with color. You can get contrast with both color and light and dark, and sometimes you need that color change. After that, a bit of purple for the feathers and hair of the Imp, a flesh tone for the little guy, and some pink/red for the mouth. I wouldn't end up highlighting or shading any of this except for the tongue, which got a couple white highlights just at the end. Everything else was done with a single glaze, using the undersketch to put the shadows in for me. The final bit of the model other than the dirt that I needed to do was the shield. Have a look at the picture on the right. Remember how we talked about shiny surfaces like metallics reflecting light in the same way that the light hits it? This shield is a pretty good example of that. The sun is reflecting off the top of the central metal piece, the edges of the rim, and the rivets. In order to make this more realistic (no metal is truly just grey, black, and white), iI added a light glaze of Meridius Blue to the transition between the black and white parts to give it a mid-tone. I also did this to the pole-arm, but I forgot to take pictures. Finally I did the dirt on the base, and called him finished. It took me probably 25 minutes to get all the glazes down once the sketch was finished - not too shabby! That's probably my favorite thing about sketch-style - it's so fast once you get it comfortably in your hands. Here he is all finished up. I hope this article was helpful, informative, and entertaining! I'll definitely be continuing to work with this style of painting for a little while at least - it's so much fun! If you'e got any questions or comments, I'd love to hear them! Have you done any sketch style yourself? How did it turn out? I always love to see what people are painting - it's what drew me to the hobby in the first place. As always, you can follow the Line of Sight facebook page to keep updated with all of our content and podcasts, you can find me on Twitter occasionally @LoS_Jaden, and if you feel like supporting us on Patreon you can do so at patreon.com/loswarmachine. Please go check out Matt DiPietro's website and facebook page - they're both chock full of awesome stuff and well worth a click. In closing, I'll leave you with another sketch I did of Una 2 for a friend of mine. Thanks for reading!